It's tough to beat the comfort of cotton when you hunt nearly every day of turkey season. Our 7oz. 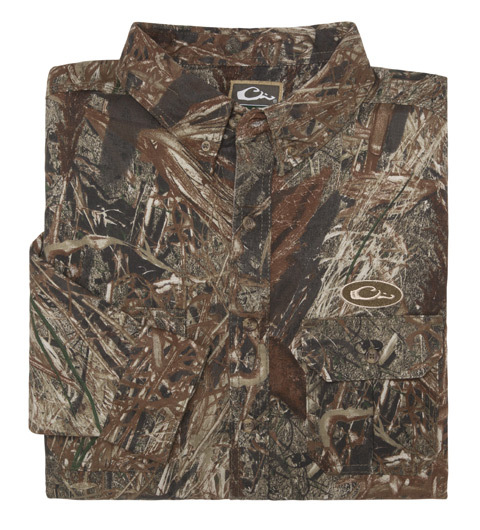 60/40 cotton/poly fabric is comfortable and durable to meet the tough demands and variable conditions of turkey hunting. But don't let the classic design of the Interceptor Cotton Shirt fool you - true to the Ol' Tom commitment of developing the most technical turkey hunting products available, Drake treated this product with Interceptor™ Silver Anti-Microbial Technology. Interceptor Technology uses colloidal silver, a non-allergenic technology that is extremely durable to washing, to destroy human odor at its source.